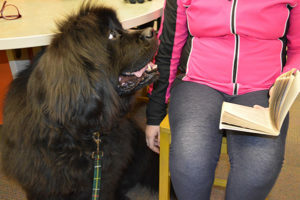 Our Paws to Read programs are held at schools and libraries in Central Indiana and offer children an opportunity to practice reading to a Paws & Think therapy dog. Research shows that therapy dogs can help to reduce anxiety as well as improve focus and attention span. Therapy dogs serve as a calm presence and allow children to work to improve literacy, comprehension, and communication with a nonjudgmental listener. Paws & Think is an affiliate of Reading Education Assistance Dogs (R.E.A.D. ), a worldwide organization focused on improving the literacy skills of children through the assistance of registered therapy teams. This partnership allows Paws & Think’s therapy team handlers the opportunity to take additional training as literacy mentors to help children gain confidence, improve social skills, and develop a love of reading. Below is a list of our current list of Paws to Read venue partners. Our library Paws to Read programs are open to the public. If you are interested in starting a Paws to Read program at your venue, please email us at info@nullpawsandthink.org.